My neighbor wanted a very unique gift for his wife for Christmas, so a few months before, he came to me with ideas about a rolling kitchen island. He had already sketched out the general look of what he wanted, so I asked a few more questions to make sure we were on the same page with casters, the top, number of drawers, paint color and a few more details. I got started by unpackaging all of the galvanized pipe. I used 1/2" pipe for the handle/towel holder that would go on the side. I'm not sure why I started on this first, since it would be one of the last things to go on the piece. I think it is just nice to get started on something easy with a big project. That's what I've found anyway. It helps me want to keep going into it. I wiped down the pipes with acetone to remove anything sticky or any residue left. Then, I assembled the pipes into their final configuration. I could have just used black iron pipes, but I used the galvanized ones for a reason. The hardware the client wanted to use was a weathered nickel, so it had some silver and black elements. They didn't originally want to go with these, but I suggested them to stand out just a bit from all of their current hardware. The style matched their current hardware exactly, but this would make it an accent piece. I then spray painted the handle black, but only using light coats so some of the silver would faintly show through. Then, I pushed some screws into a piece of cardboard so I could spray the heads black to match the pipe. Then, I set all of that aside and turned my attention to the top. I took some 8/4 (that is pronounced "eight quarter" and just means it is 2" thick) walnut and some 4/4 hard maple to use for the top. 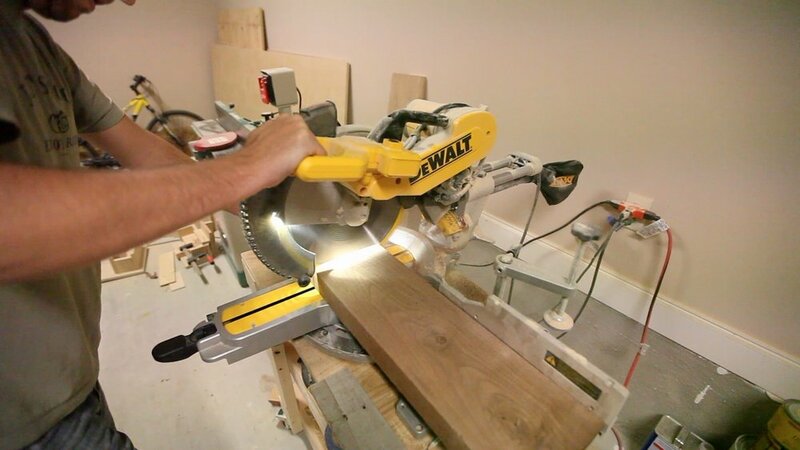 The walnut was rough material, so it had to be milled up. It was slightly wider than what my 6" jointer could handle, so I had to figure out a different way. I just ran the face of the walnut boards across the jointer head like I would normally, but this left a slight lip on one side. I took it to my bench and used a No.4 hand plane to remove that little lip. Then, I sent it through the thickness planer a few times with the newly flattened side facing down. This gave me 2 perfectly flat and parallel (probably the most important) faces. 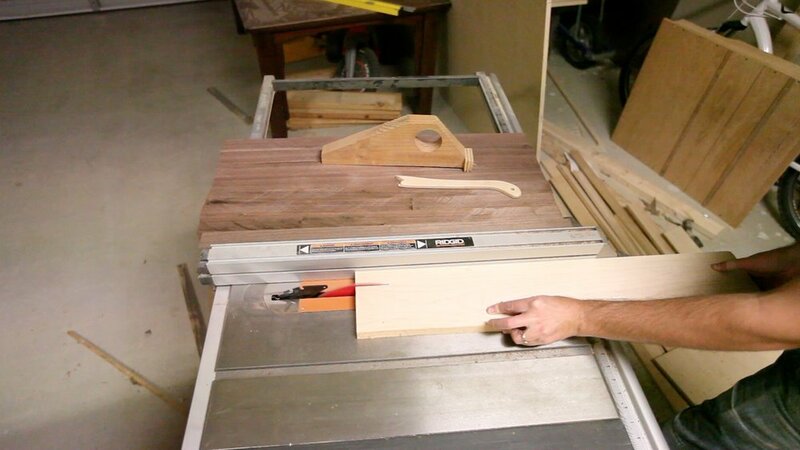 Then, I took them to my table saw to rip out the strips I would use to make the top of this kitchen island. I have found with my table saw at least, it has a hard time ripping straight through 2" hardwood. what I have found that works is to put the blade about half of the height of the material, run it through, and then raise the blade so that it cuts all of the way through, and finish the cut. That keeps the saw from getting bogged down, and if there was any stress in the wood, it tends to pinch the blade less making it a much safer operation. I ripped strips off the thickness I wanted the top to be, which ended up being about 1 1/4". Then, I laid everything out to see how I wanted it to look. I started marking, with a piece of chalk, where I wanted to put my dowels. I was going to use dowel joinery to attach the strips together and add some strength. After drilling the first couple of holes, I used some dowel centers in those holes to mark the location of the holes on the adjacent strip. I only had two in this size, so I just had to move them a lot. I did this by hand, because I didn't have a drill press at the time. Then, I cut out my dowel pieces and rounded over the edges on the belt sander. This took much longer than I anticipated. And that's when it happened...everything went wrong. I could not get the dowels to line up enough for the boards to come together in a seamless way. How frustrating! After all of that work, drilling out the holes and then cutting all of the dowel pieces and rounding the edges! Argh! So, I ended up just calling an audible and scrapping the idea of the dowels. I just glued it up as if it were a large cutting board. It will have enough support all around the base for it not to be a problem, but I just don't like that I couldn't get the dowels to line up. Oh well, these kinds of things happen during projects and you have to just be able to roll with it. The next step was to turn my attention toward the cabinet or base. I had taken the time to create a Sketchup diagram of the entire piece, with help from some very helpful tutorials created by Jay Bates. He really lays things out clearly, and I learned a lot just from watching a few of his videos. I created a cutting diagram so that I would not waste any plywood. 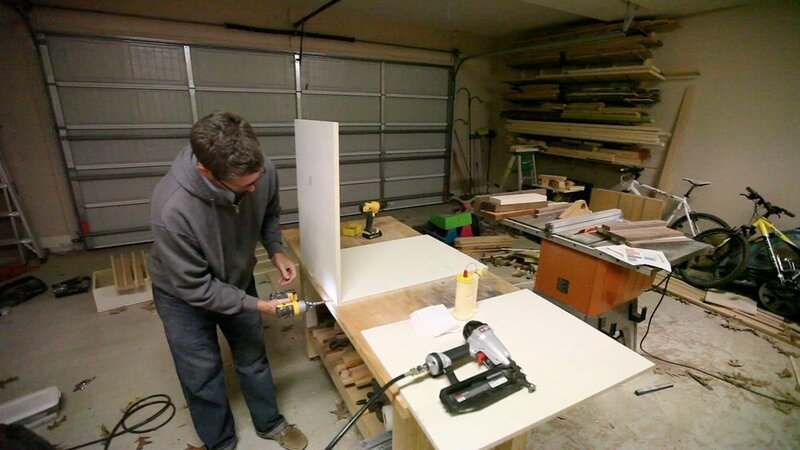 I had 2 sheets of plywood, and I was able to arrange it so that I could get all of the cabinet pieces out of those two sheets, with a good bit left over for other projects. I started milling up that plywood into pieces, marking them as I cut them. There was not much to this, and it did make it easier having that cutting diagram. Before I started assembling the cabinet, I checked with my neighbor (client) to see if he was sure he wanted 4 drawers in the cabinet. You see, it was only 32" tall, and having 4 drawers would make them really shallow. I'm glad I asked, because he decided he wanted the drawers to be a little deeper. Therefore, we nixed one of the drawers, ending up with just 3. I didn't have enough plywood to make these corrections out of what was left originally, so I had to go pick up another sheet of plywood. I assembled the cabinet using wood glue and brad nails. Then, I came back and added some countersunk screws. This cabinet will be painted, remember, so it didn't matter much what type of joinery was used. For the front face, I used pocket holes to create one single piece. Then, I just secured that to the rest of the cabinet sides. 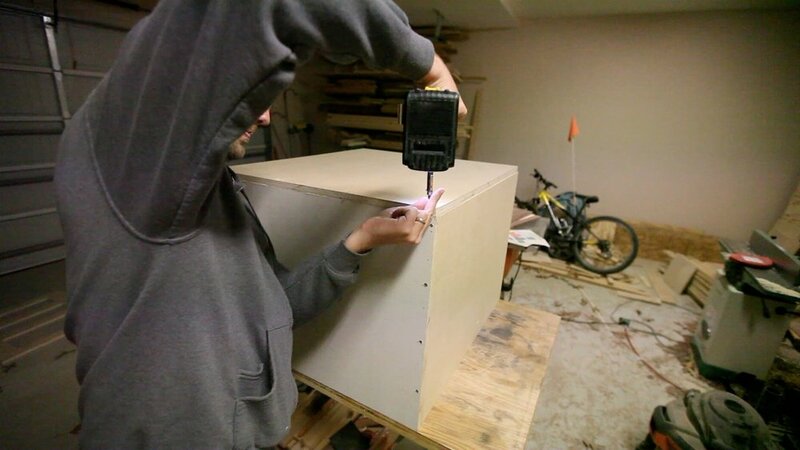 For the drawers, I used 3/4" plywood for the bottoms, so I didn't have to buy any more material. The cabinet was wider than the drawer openings, so I had to put some runners for the drawer slides to secure to. This was kind of a pain, but with the use of some spacer blocks and patience, I was able to get them in. Next, I used some spackling to patch any holes and to fill in some of the gaps in the showing ply, since this was cheap plywood. Then, I painted the cabinet. I used a mini paint roller with a foam roller on it, and it seemed to work quite well. I was able to paint the whole thing in a matter of probably 30 minutes, including the drawer faces. I forgot to add a groove around the inside of the sides so that I could use some table top fasteners, so I borrowed my neighbor's Festool Domino. 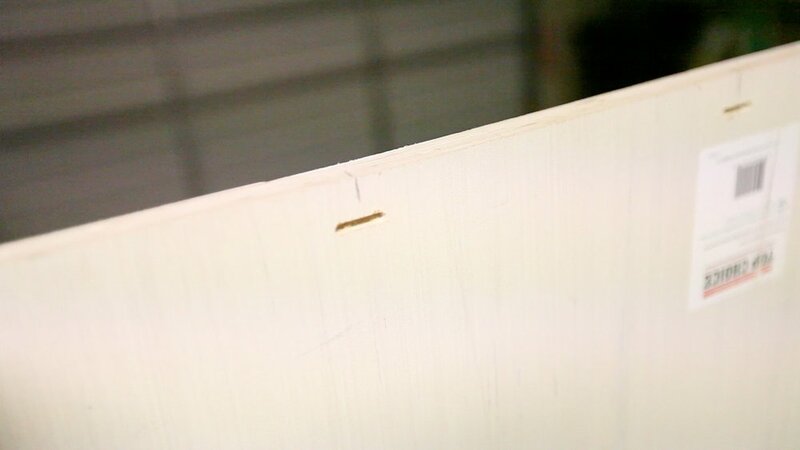 We used that to put a few small grooves at certain points all around the inside of the cabinet. This worked quite well. Next, I added the large casters to the bottom of the cabinet. Two of them were non-swiveling casters, and the other two were swiveling, double locking casters. I thought these were really great, and they are a neutral color, so if you're looking for some high-quality casters, use these. Next, i added the full extension drawer slides to the cabinet. These are a little bit more expensive, but it is well worth it to have the ones that fully extent. It really gives the piece a premium feel. Finally, it was time to attach the top. With the cabinet sitting on the hardwood top, upside down, I marked where the holes needed to be drilled for the table top fasteners. 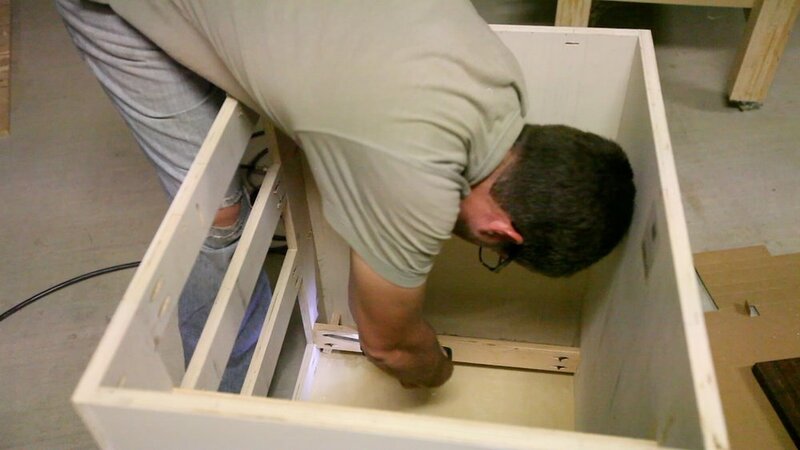 Then, I removed the cabinet, drilled out the holes and attached the hardwood top to the cabinet. All that was left at this point was to turn it right side up and check it out.